I just signed up after finding this forum searching google for help. I recently purchased a Makita 2030 jointer/planer. I was perusing craigslist for a jointer and came across this. Had never heard of it but everyone seems to rave about them and a planer is always good to have so I bought it. It’s in pretty good shape from what I can tell so far. But as usual the rollers need to be re-coated. I intend to send them to Western Roller when I get then removed. I’ve read through quite a few thread here and elsewhere but haven’t found any instructions on the removal. I’m not real mechanically inclined but if it’s at all intuitive I can usually get it done. I’d really like to know the process before I tear into it to hopefully avoid ruining anything along the way. I have had the side cover off that exposes the gears. And I’ve located the phillips head screws that everyone has trouble with. I couldn’t budge them either. 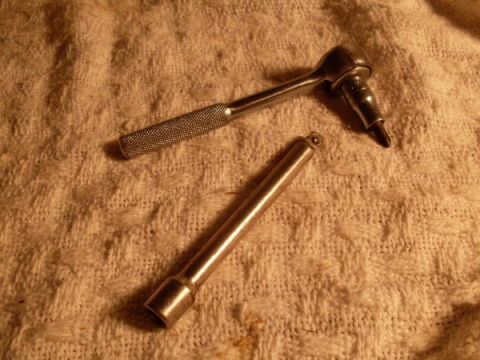 I have read some tips like using an impact wrench and various lubricants. If anyone has this knowledge and would care to help it would be much appreciated! Pictures/vids are always the best but I haven’t found any. I did download the manual but it didn’t address this issue that I could find. You need to remove the drive chain and gears from the end of the rollers first. Remove the circlips holding the gears on, then pull up on the tension roller and the chain and gears should come right off. 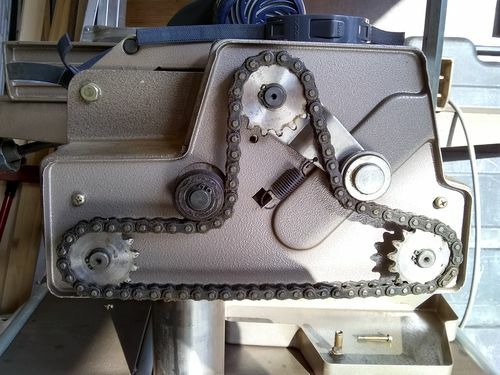 I found it easier to go ahead and remove the rest of the gears and backing plate as well, as it gives you extra access to the rollers – but it is not required. Once you get them out, replace with socket head screws to make future removal easier. If you have buggered up a screw beyond hope – grab it with a pair of vice-grips to get it going… once it turns just a hair, it’s super easy to remove the rest of the way (sometimes just with your fingers). 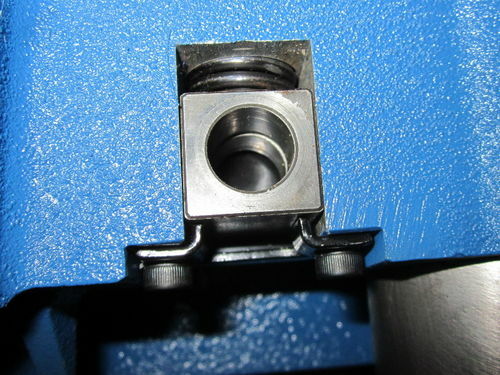 The rollers are supported in what Makita calls a “plane bearing” which is just metal sleeve (bushing). They are spring loaded, so be careful when removing. The easiest way I found is to first loosen the bearing support on the gear side of the roller first. Do not remove it yet, just back the screws out a quarter inch or so. Next, remove the bearing support on the opposite side of the roller. This will let that side drop down enough to slide the roller out of the bearing on the gear side. 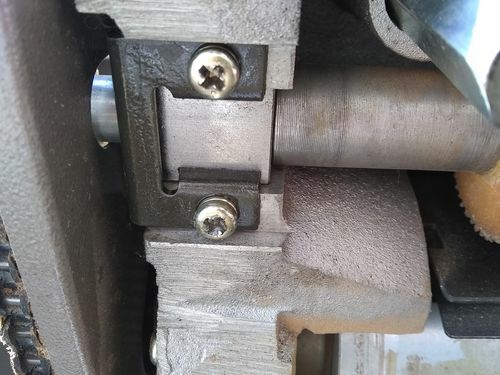 Once the roller is removed, the other bearing support, bearing and spring can be taken out. Do this for both rollers. Examine the old bearings to make sure they are not worn or damaged and replace if needed.